Unfortunately the script index on Barney doesn't seem to work but there are others over there if you nose around. Now up and working again. 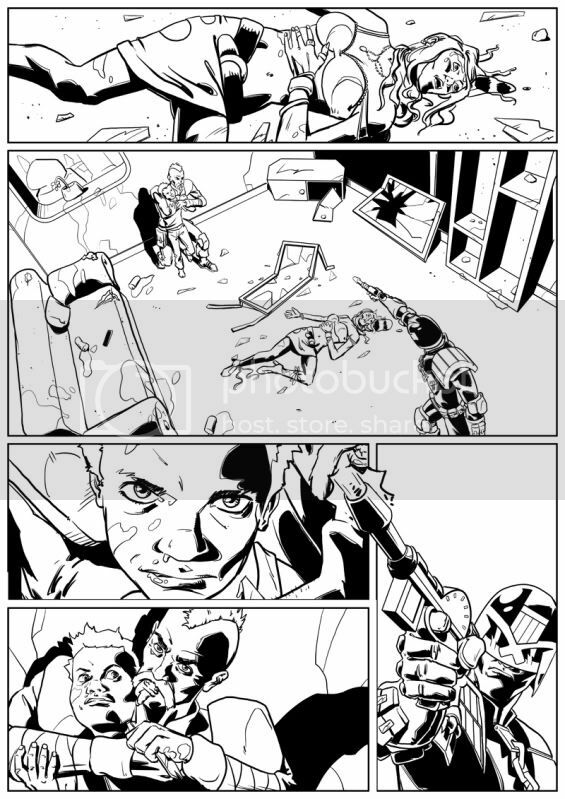 Can anyone tell me the page dimensions for a 2000AD submission? If in doubt (and you can't find a thread on this topic already), start a new thread in this area asking for advice. There are some "Cycle of Violence" ones above but some more general reference guides for Judge Dredd can't do any harm. If anyone needs any specific reference images then start a new thread in the help forum and someone will be able to sort you out with those but please be as specific as possible as if we have to try and guess what you are after it lowers the chances of a quick and easy resolution. Anyone know of any others? If you have done one then think about bunging up somewhere like ComicSpace (which makes it easy to do, as above) or DeviantArt and bung us the link, don't worry critiques won't be provided unless you specifically ask for it. I remember having a bash at Cycle of Violence, and even though there wasn't any writer credit on the script, when it got to the cadet stuff where the main character is being bullied "Robbie Morrison" popped into my head. I'm having a bash at Cycle of Violence, gonna submit it to Thargy baby and see if likes it enough to throw bucks at me for doing more. Never know. That's great Thargy baby will be gagging on it! Looking forward to seeing you in print! I'll happily contribute to this thread (giving crits/advice), if people are willing for me to do so. PLEASE say so though as I don't want to wade in and upset anyone! That's quality work. However, I have to point out the Mk1 Lawgiver ... the current model is actually a bit of a swine to draw, but if you're serious about a gig with Tharg, you'll have to draw the bugger! but wasn't cycle of violins ages ago and the kid's grown up now? I'd forgotten that opening sequence was a flashback. I'm a muppet. However ... I do have a bit of an issue with that block of three panels at the bottom. It's difficult to know what order to read them at the best of times (vertical first and then two horizontal works; two horizontal and then vertical doesn't), but you further confuse the reading order by breaking the panel borders and drawing the reader's eye into the final frame before the penultimate. I absolutely agree about the last 3 panels, I'll come up with a solution. The gun shot wasn't meant to be quite so angled, more straight on, but it worked well so I kept it like that. That's the reason it bust into the wrong panel too. Oh, and PJ? Feel free. PJ! PJ! PJ! PJ! PJ! Well, Jim's covered the thing that was shouting out for a change, so I'll not mention it. Like your art - nice and clean, easy to read and understand also like the inking. Panel 2: I blacked the walls, and moved stuff around, as it existed it struck me that, compositionally, a lot of attention was being focused on that table - not having read the script, that could be exactly what we're supposed to focus on - but I'm guessing not. So I blacked the walls (making the space feel tighter - like we're in a more confined area, I moved the girl to the centre (and moved the table out of the way, though, I probably should've deleted it, it's still fighting for attention. I shifted dredd so he was no longer cropped off panel (though I suspect you'd be better redrawing him to get him to fit better). Unfortunately the script index on Barney doesn't seem to work but there are others over there if you nose around. Logan sent me an email about this and the index has now been fixed. I think PJ's changes to panel 2 should probably be laid up side by side and pinned above the drawing board of every aspiring artist! I'll confess, I'd never have thought of something as straightforward as blacking in the walls, but it focuses the reader's eye inwards so completely that it makes me want to stand up and applaud!